Our favorite blue engine is coming down the tracks with all-new episodes! 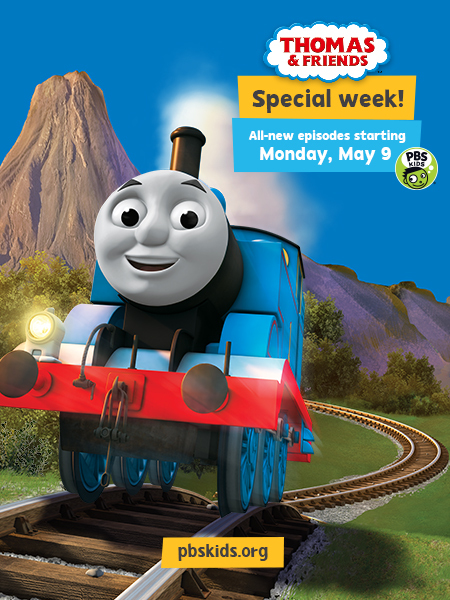 Tune in to WSKG-TV beginning Monday, May 9, 2016 at 12:30pm for a full week of new episodes from Thomas & Friends. Timothy and the Rainbow Trucks: Bill and Ben convince Timothy to search for a truck that is blue, red, yellow, and brown. However, they are playing a joke on Timothy; the truck does not exist. When Timothy finds junkyard trucks that match the description, Bill and Ben’s prank is foiled! Samson Sent For Scrap: When Scruff breaks down, Samson is given the job of collecting the track-side scrap. Taking his job a little too seriously, Samson collects more than he should-including Sir Topham Hatt’s car! Before it gets crunched by Reg’s Claw, Sir Topham Hatt races off to save it. Marion and the Dinosaurs: Marion wakes up in the middle of the night and sees a long line of dinosaurs gliding past in the moonlight. Thinking it was a dream, she tells Thomas. The dinosaurs return and chase Marion to the castle, where she discovers that they’re model dinosaurs for the Earl’s new Dinosaur Park! Millie and the Volcano: Harvey and Samson are arranging the dinosaur models for the Earl’s new Dinosaur Park. When one of the dinosaurs swings towards Millie, she becomes frightened and Samson and Harvey laugh at her. In return, Millie seeks the last laugh. She plans for the groundsman to set his bonfire behind the model volcano, making them both think it’s erupting!